2nd May 2007. Australia had just won the ODI World Cup in Barbados and they were on their way home via London Heathrow. How do I know this? Because I saw them there! I looked to my left and there was a man. An absolute hulk in fact that made me – a modestly sized man – look like a cat in a pack of lions. It was Australian all-rounder Andrew Symonds, barely able to fit through the body x-ray machines, his shoulders as wide as I was tall. Four days earlier, Symonds had contributed 23 runs and a wicket to the Australian 53 run drubbing of Sri Lanka, helping Ponting’s men to a third ODI World Cup in a row. 2007 was slap-bang in the middle of a golden era for Australian cricket of course. As well as their ODI crowns, the Aussies were in the process of going 16 Test matches unbeaten, a run spanning from December 2005 to January 2008, during which they managed a sketchy 5-0 series win over England I believe? Anyway, as we continued through security, my excitement during what is normally one of the most tedious tasks known to modern man was elevated to ridiculously high proportions due to the presence of the entire Australian ODI squad. Nathan Bracken with his blond, Stuart Broad-esque locks glided past me, as did a young Michael Clarke and a not-so-young Glenn McGrath - surreal. There I was stood in front of the entire Australian cricket squad, the best cricket side in the world. It would make sense for me, a massive cricket fan, to take photos, ask for autographs, talk to these legends, these champions. But no. I stuttered. I dawdled. I failed. As we left passport control, the moment was over. The Aussies had buggered off into the Business Class area away from the riff-raff, my wife-to-be and I included. But hang on a second, because there in front of me, large as life, was Ricky Ponting. Well, when I say large, he was no Andrew Symonds. Punter was my height, perhaps slightly taller, and resplendent in Australia’s green blazer. Without a baggy green adorning his head he was almost unrecognisable away from the cricket pitch. “That’s Ricky Ponting,” I gasped to Maria. My lady was - and still is - no cricket fan, so I had to elaborate. “He is the captain of Australia,” I exclaimed. “He has just lifted the cricket World Cup in the West Indies.” , I concluded…ish. He will go on to play an astonishing 168 Test matches, scoring 13,366 runs – the second highest run scorer in Test history behind only Sachin Tendulkar. “Go and get his autograph,” Maria urged. But what’s the point in an autograph? Years earlier I had asked boxer Nigel Benn to sign a one pound note when I met him in Jersey, but ended up having to spend it weeks later having fallen on tough times. As a result I don’t have a huge fondness for autographs, and so decided against getting Punter’s pawmark. “Well, shall I take a photo of you with him?”, Maria continued. But that just felt too needy. Punter looked at me. I looked at him. I probably looked like a crazed, testosterone-fuelled teenager gawping at a girl he fancies but clearly stands no chance with. I walked towards him. He went to walk around me. I changed course and walked towards him. Like the teenager closing in on the girl, would Punter leave me hanging? No. Like a gent he put out his hand. We shook. “Congratulations on the World Cup, Ricky,” I said. A mightily impressive achievement I thought, considering my social ineptitude. “Ah, cheers mate," Punter replied in his thick, Tasmanian drool. Cool, calm and - let’s face it - completely uninterested as he was. And with that, he headed off into Business Class, whilst Maria and I went off to find our cheap seats for Thailand. Maria said yes to my eventual marriage proposal. But even better than that, some might say, was that she got me a handshake with one of my heroes, and I’ll always be thankful to her for that. Oh, and for having my two children, obviously. 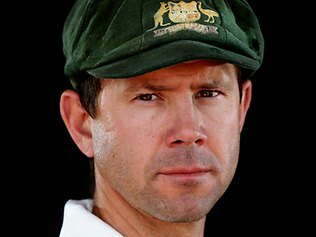 Ricky Ponting is one of the finest Test batsmen I’ve ever seen. Tendulkar may have scored more runs than him but Punter’s fight sets him apart in my opinion. Ashes battles won’t be the same without him. Go well in retirement, Punter.